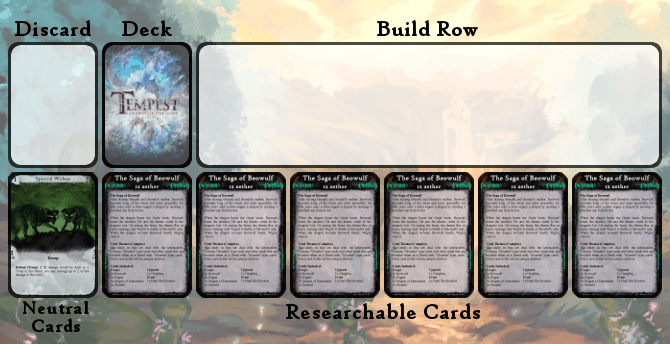 In a previous post, I mentioned that I was experimenting with how adding cards to your deck (“researching”) would work in Tempest. Researching is a big part of how the game plays, as it separates Tempest from other strategic card games. Instead of coming to a game with a prebuilt deck, you build your deck as you play. 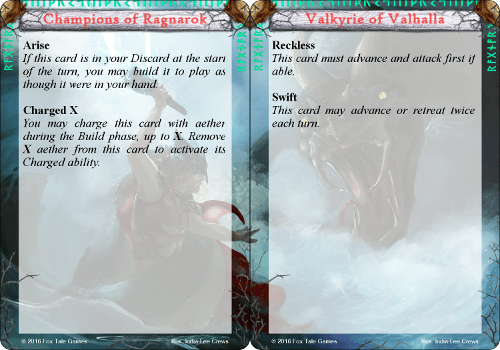 Cards from your deck can also be discarded to gain resources to play other cards (giving it a further deck-builder aspect). Of course, this meant new players were confronted with an overwhelming amount of choice of which cards to add to their decks! Players would previously choose the Deity they wanted to play as, then pick a Temple and Battleground that matched their faction. Each of those would come with 13 cards that combined to form their Research (from which they could buy during a game). I recently took those 13 cards and broke them down into 2 lots of 6 cards. The 6 cards combine well together (thematically and strategically). When players stack those 6 cards on the table, they put a “Tale” card on top, which describes (on one side) the utility of the cards you can buy from it, the cost of buying all of those cards as a pack, the card names, and some story text, and (on the other side) further elaboration of the story. Over the weekend, I took this new version of the game for a spin. It worked really well (at least, for an internal playtest)! 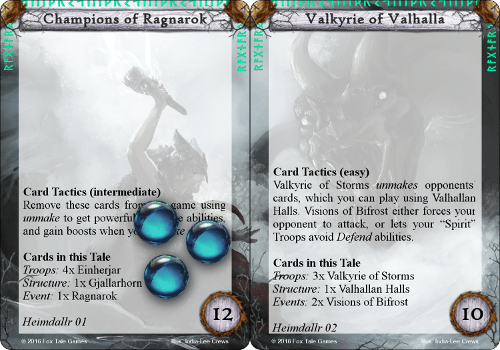 An early prototype of the Einherjar card, from the Champions of Ragnarok set. 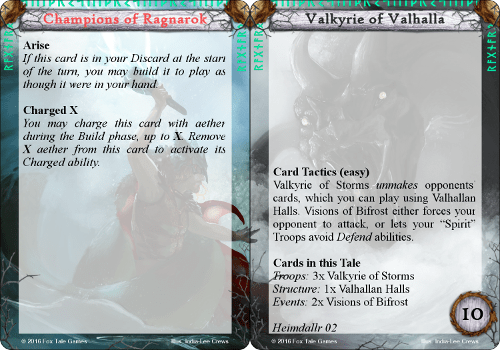 Plenty more room for nice big rules and lots of flavour text! Turns were a lot quicker, there was less deliberation, strategies were more readily apparent and, as the games continued, strategies across “Tale” cards arose. Being able to indicate on a Tale card whether the inherent strategies were complex or simple also helped. Players just starting the game tended towards simple Tales, and started buying one or two complex Tales as the games went on. Being able to link the aether that cards in Tales could be discarded for with the aether cost of the Tales allowed me to separate “cost” and “aether discard”, so players could invest a lot into one Tale and rapidly ramp up their economy, or invest a little at a time and slowly do so. 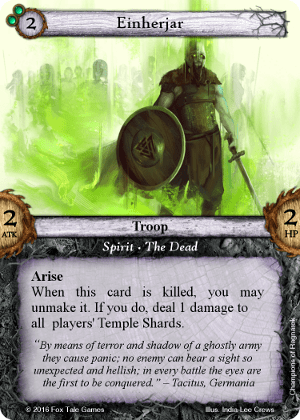 One of the other issues that plagued early playtests was that putting rules like Ambush or Defend on cards required an explanation of that ability on every card. Playtesters hated having to resort to the rulebook every time they looked at a card. I discovered that I could actually put those rules explanations on the completed side of the Tales. It did remove some of the story elements of the Tale cards (which I am not totally happy with), but it left the individual cards with more room for rules (letting me increase font sizes) and flavour text. There actually wasn’t much bad. Out of what I predicted to not work, junk cards were easily discarded for aether, removing cards from the game was deadly but not decidedly so, so far I have not found any insta-win strategies (though the Ambush ability is pretty powerful and might need amending), and restricting players from using all the cards actually forced them to use ones they otherwise would have ignored. There’s no getting past this. Having six Tales that look identical is pretty ugly on the table. Distinguishing them from each other is even harder. 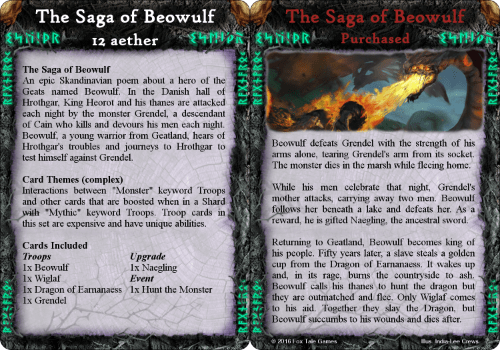 I’ve just revamped the appearance of the Tales to make each of them instantly recognisable to players. Since your Deity, Temple and Battleground each comes with two Tales, setting them out on the table created a tableaux of sorts (thanks T.I.M.E. Stories for the idea of using cards as a tableaux). I also grayed the “incomplete” side and gave full colour to the “complete” side to further indicate to players which of the Tales they have purchased. Now players can put aether on a Tale to purchase the cards under it. Then if they decide to purchase both Tales from one of Deity/Temple/Battleground, they get a nice colourful tableaux using art from the game. I’ve yet to put this into action, but hopefully I will get a chance to test it this coming weekend. But if I’ve taken 13 cards and broken them into 2×6 cards, what happened to the last card? 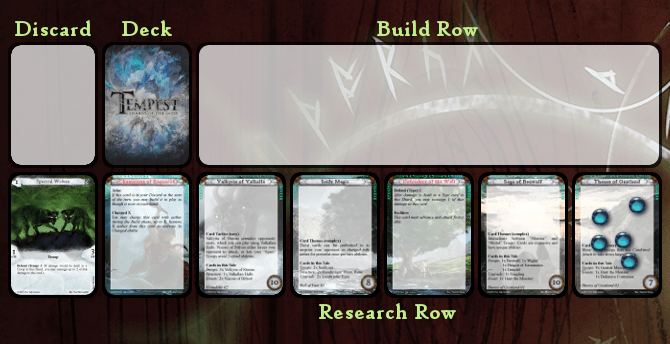 Well, I’m testing ways for generic “deckbuilding” styled cards to be added to any deck. The Neutral Shard that each player picks at the start of the game will come with 4x Neutral cards. (So, for example, the Flood Plains Neutral Shard comes with 4x Freshwater Butcher crocodile cards.) If you have a Troop in the Neutral Shard, you can pay a certain amount to buy a Neutral card for your deck. Anyway, we’ll see if this even works at the next playtest! Here is the homeprint version of the Tales cards, ready for playtesting. ← Research: Focused or General?